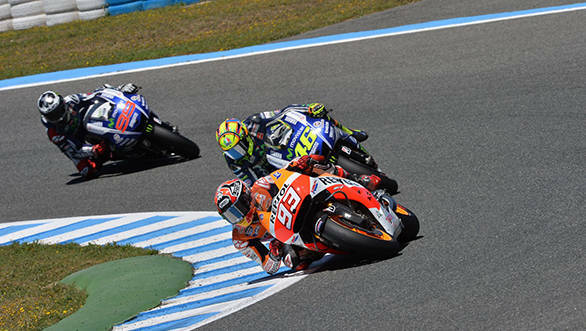 The 2014 MotoGP championship has been a complete one horse race with Marc Marquez demolishing all opposition. He's on a nine race winning streak and leads the championship by a massive 77 points. This isn't to say that it has been a boring Marquez-wash. The last nine races have seen some colourful nail-biting action. Marquez has had to fight off either Valentino Rossi, Jorge Lorenzo or Dani Pedrosa, or a combination of two, and even all three of them, every race weekend. While MotoGP takes its well earned mid-season break, we take a look at the bouts Marquez has been involved in so far. 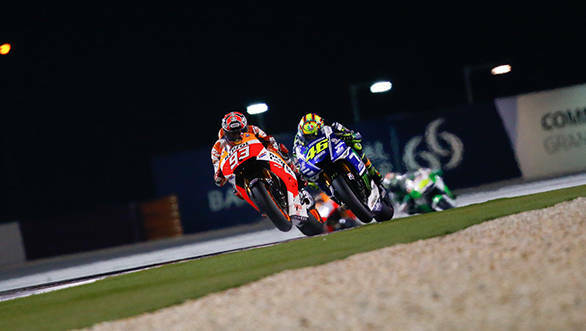 At the opening race of the year, it was Rossi who pushed Marquez hard most of the race. After an exciting last lap, it was Marquez who finished on top. And it was a brilliant way to start the season. At that point, Marquez fans had no idea that this kind of action was what they'd be treated to nearly every race weekend that followed. 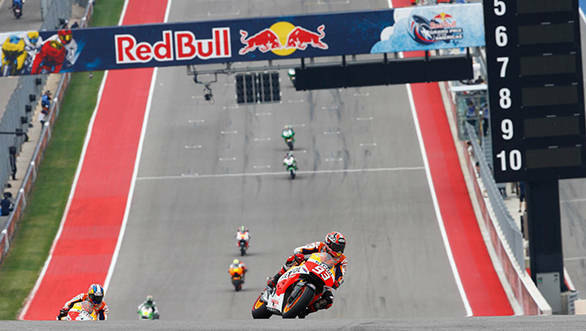 The American GP turned out to be a Repsol Honda show as team-mates Dani Pedrosa and Marc Marquez gapped the field. 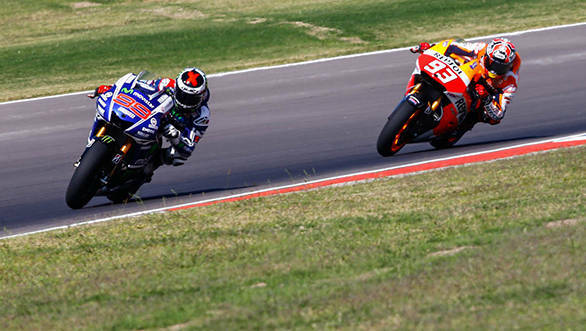 Pedrosa tried to keep up but just couldn't match his team-mate's blistering pace. Jorge Lorenzo recovered from crashes in the opening two rounds to take the fight to Marquez. He led for 17 laps before Marquez made his move and then never looked back. An inspired tyre choice by Rossi allowed the Italian rider to brake later than ever on the Yamaha M1 inspite of which he only managed to beat the rest and Marquez comfortably led the race from start to finish. Rossi got off to a good start in Le Mans and was leading the race by the fourth lap. Marquez had a terrible start and dropped to tenth after the start. Like a true champion he put his head down and charged to the front, pushing past Rossi on the 12th lap into the lead and over the finish line 16 laps later. 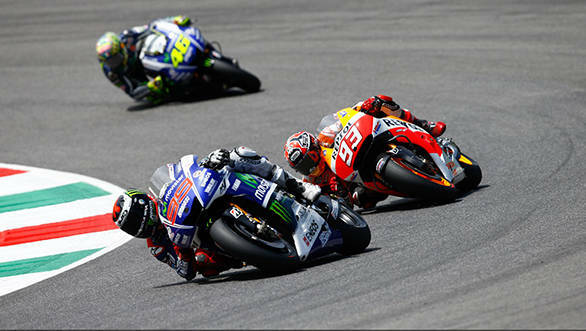 Monza was again witness to another superb battle, this time between Marquez and Lorenzo. After the flag-off, it was a blur of blue and orange as the 99 Yamaha and 93 Honda were separated by just inches of tarmac. 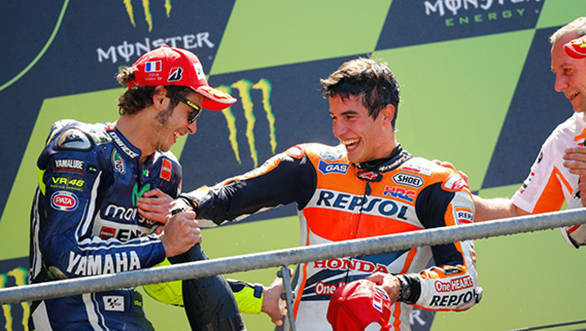 The battle went down to the penultimate lap where Marquez made a move on Lorenzo that he couldn't recover from to take his sixth victory in a row. Winning was becoming a fashion of sorts but the racing was ever so exciting. After all that brilliant racing the entire season, we couldn't imagine it getting better than the race in Mugello, but man were we wrong! The Catalunya race saw everyone take a swing at Marquez with Rossi, Pedrosa and Lorenzo challenging for the lead at one point or the other. This one went down to the line with Pedrosa and Marquez touching wheels on the last lap. 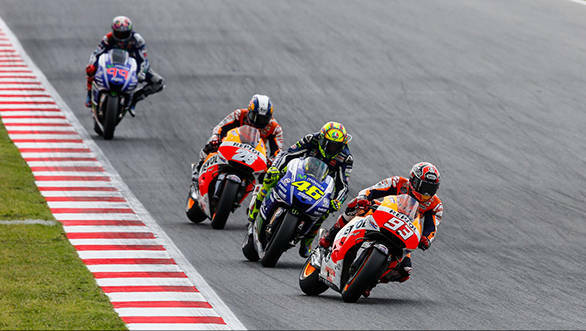 Pedrosa ran wide, handing second place to Rossi while Marquez carried on, unfazed, across the finish in first. 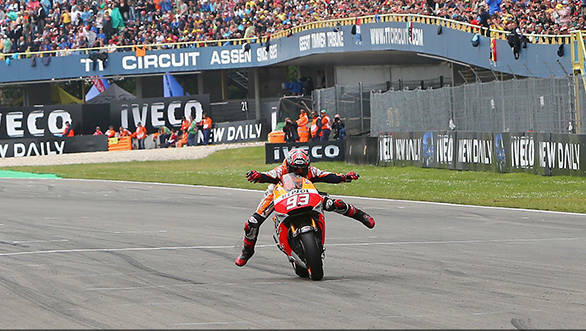 In Assen the weather tried its hand at halting Marquez's winning streak. The rain however only managed to make him run off track on lap 8 when he moved on to his second bike and slick tyres. Once the track dried out a bit, he slid the Repsol Honda 93 around an astonished Andrea Dovizioso on the Ducati and sped-off into the distance. This was now win number eight and he became the first rider since Giacomo Agostini (1971) to win the first eight races in a row. 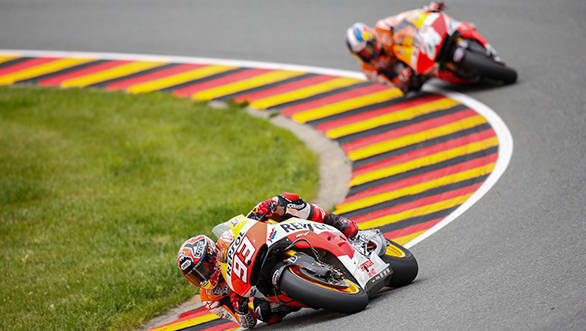 In Germany it was again team-mate Pedrosa who was Marquez's closest competition. Dani was also in form the whole weekend, posting quicker times and only losing out on pole in the dying minutes of qualifying. He stuck to Marquez's coat tails the whole race but never came close enough to make a pass on the tight circuit. After winning his ninth race in a row Marquez said, "I'm really happy for this victory. Now we can relax a bit!" When the score cards read 'Marquez: 9 Rest: nil', he certainly deserves it. Marquez now leads by a massive margin and is setting new records every race. His next target will be Agostini's 1972 record of eleven wins in a season. Even Rossi admits that the championship race is all but over and Marquez needs to "try and win every race". Rossi has taken him on more often than most this year and to hear a statement like this from him is quite telling. "It's our job to try and beat him," adds the seven-time champion with a big grin - he's still having a blast.